The Otaku House: Viva Zapata! With Donald Trump's recent visit to my town, I thought a positive movie focusing on some Mexicans that weren't "rapists or criminals" would be a good idea. I chose to dust off my copy of Viva Zapata! for this little project. The blu-ray in fact is quite new, but I just haven't had a chance to watch it. Elia Kazan is a director whose name I can never seem to remember even though he directed some absolute classics: A Face in the Crowd (a movie I will continue to sing the praises of until people get annoyed enough to watch it), A Streetcar Named Desire, East of Eden, and a certain film called On the Waterfront. He directed more during his lifetime, but I can't say that I've seen them. Unfortunately, there never seems to be enough time to really whittle down my ever-growing queue of stuff to watch. 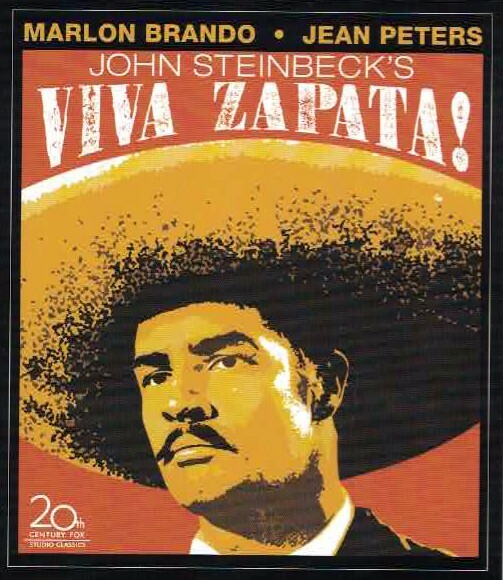 However, Viva Zapata! is a film I made time for as it is yet another of Elia's "Marlon Brando" era movies. Believe it or not, Mr. Kazan actually made three whole movies with the notoriously difficult Mr. Brando. That's almost like a marriage in the movie world. Lord knows that Brando had his share of flops, but I still argue that Brando during his era when he was "on" is still superior than so many other actors. This movie was made when Brando's career was indeed on fire. Does that mean that this movie is a classic, too? Hmm. The stars seemed to have aligned for everyone involved. John Steinbeck penned the script, the aforementioned Elia Kazan directed, and the likes of Anthony Quinn, Joseph Wiseman, and Jean Peters rounded out the supporting cast. Even Alan Reed, the voice of Fred Flintstone, was tapped for a role. This movie had the makings of a hit and became one on it's release, but is it now? Well, this film was made in 1952 and its subject matter in America is a bit obscure. It's tough to understand the politics of a film that takes place in Mexico during the early 1900's and features characters that aren't common knowledge outside of Mexico. I'm even curious as to whether or not Emiliano Zapata was obscure to Americans back in 1952. However obscure it's history may be or even it's historical accuracy may be, there's no doubt that the film made history in a certain aspect. Anthony Quinn became the first Mexican-American actor to win the Best Supporting Actor Oscar for his role as Emiliano Zapata's partying and womanizing brother. Brando did a fine job as the leader of a Mexican rebellion. There are some ever so subtle movements he makes in certain scenes that I think are really top notch. The scene where he tries to impress the family of Josefa (Jean Peters) as they exchange proverbs in an almost sensual manner is a neat one. Somewhat pointless for the story as a whole, but neat. But that's more of an editing issue. The movie itself seemed like it could have been more focused. Maybe even trimmed. Steinbeck's flair for words and the meandering pace make it difficult to classify this movie as a suspenseful war movie. It's more of a character piece with a lot of dialogue accompanied by scenes of war. Although it is good dialog for the most part and there are some great lines. Marlon Brando even gives a great speech near the end. There is always the age old issue of the "white guy in a non-white role" to consider, but this movie is in black and white and Brando had chameleon-like abilities even in technicolor. Not everyone in this movie fared as well (Jean Peters and Alan Reed were rather bland in their roles), but at the very least Brando was the focus and he did not disappoint. As for another white guy that managed a fairly convincing portrayal of a Mexican, Joseph Wiseman gave what could probably be the most fascinating role in the entire film. The trio of Brando, Quinn, and Wiseman really make this movie a treat. More Mexican-Americans should have been used in the film, but this was 1952 and we should thank our lucky stars that the talented Anthony Quinn got a role at all. And I'd say he deserved his Oscar. Would I recommend this? Well, sure. This is a really good movie even if it does feel a bit overlong and so many of the Mexicans aren't even Mexican. It's somewhat like expecting homemade Mexican cooking and ending up with food from a Taco Bell at times. Although it does feel authentic in many other parts such as the setting and clothing. Viva Zapata! is not iconic quite like On the Waterfront and it shouldn't be considered as such, but that doesn't mean it should be relegated to the forgotten movie bin, either. It's a worthy add to the movie collection and a classic in its own right. Only it's a slightly flawed classic. This looks interesting, I will check it out. About the only thing I know about Zapata is that it's the best bottled salsa you can buy. My goal is to go through all of Brando's movies. I might not review all of them but I plan to watch them all. Some of them I'm really looking forward to, but others... not so much. For a guy in so many classics, I wish he made better movie choices during his career. I've got to try that salsa. They have it in my Wal-Mart and at Publix grocery stores. Be sure and get the hot (if they have it).